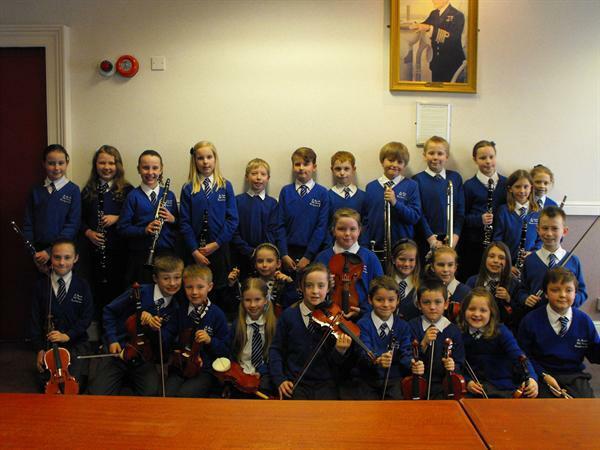 St Joseph's Orchestra was formed in February 2012 by Mrs Shirley Mills and we started with 28 pupils taking part. We were assisted by Mary Lawrence and several parents joined in to help us along. Our first performance was at the Queens Diamond Jubilee Street Party held in our playground. We have played Christmas carols at the Key Stage 2 concert in Our Lady church. It was very exciting as we played up on the balcony! We take part in the Highbridge Festival of the Arts and have achieved fantastci results. We always share our hard work with parents in an end of year concert. Mary Lawrence now takes Orchestra practice on a Wednesday morning from 9am.